First, my interpretation of the song is based on little more than having listened to it many, many times since I was about fifteen years old — and many of those many times while I was lying on the floor feeling melancholy over everything or nothing in particular. I bring to the interpretation my own literary sensibilities, as well as a penchant for Catholic iconography and ritual. 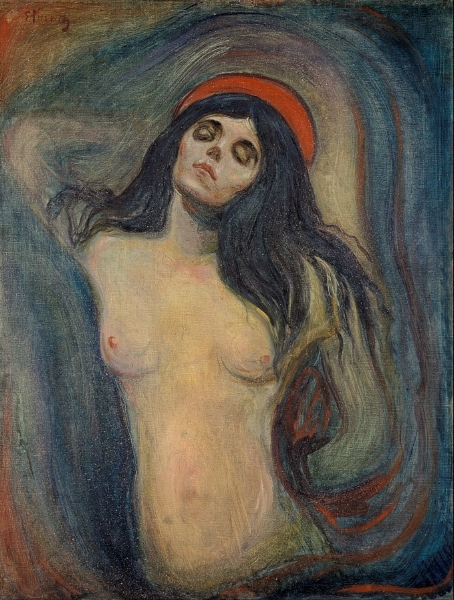 Which is in part why Edvard Munch’s Madonna is my image for the song. Each verse has this same construction — the fourth and eighth lines are questions the speaker asks the Lady, but the Lady herself remains silent, a kind of holy mystery. In this verse, the speaker asks about the Lady being buried — as if in a grave — and carried — as if a statue of a saint at the head of a procession. This is the Lady: She confounds men, leading them into a labyrinthine, disorienting world where she holds the power. Indeed, the refrain of the song says the Lowlands — of which she is the Lady — is “where no man comes.” The Lady’s domain is a purely feminine one, and her power is to deny them access to her. “Oh, do they think could bury you?” They THOUGHT, but they can’t. “Who could they get to carry you?” No one. I will not be carried at the head of their procession. I am not their figurehead. The speaker’s tone in this verse is one of astonishment — it is obvious to him that she is beyond their influence, and yet they still will try to win her over. But her power invites it — men will try to win her favor, and through her favor control her, but they will fail at every turn.